Silk Road Dance Company’s repertoire of over 130 dances included several choreographies inspired by roses, all created by our Artistic Director since our founding in 1995. Two pieces — The Rose of Isfahan (2002) and Spring Rain in the Rose Garden (1995) — draw on Persian Classical dance vocabulary. 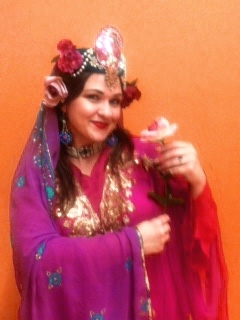 Two other dances — Desert Rose and Al Ward al Foll (The Perfume of the Rose) — use Arabic music. Desert Rose has contemporary elements, including silk veils. More traditional, Al Ward al Foll, employs folkloric Egyptian Saiidi music and dance elements. Why roses? Perhaps they are so cherished in the East. For example, the celebrated Rose of Isfahan has an intense perfume and delicate flower, making it a long-time favorite with gardeners. We enjoy sharing these enchanting dances with our audiences, reminding them of the exquisite beauty of Nature. Copyright 2013, Silk Road Dance Company®. All rights reserved.